Having been raised in a Catholic home and having attended a Catholic elementary school, there are a set of Jesus related stories that have stayed with me forever. Sure I learned about the Old Testament and other Biblical stories, but it was always Jesus’ miracles that fascinated my mind and heart. Despite my early childhood, though, I am not a scholar on Jesus Christ or The Bible. 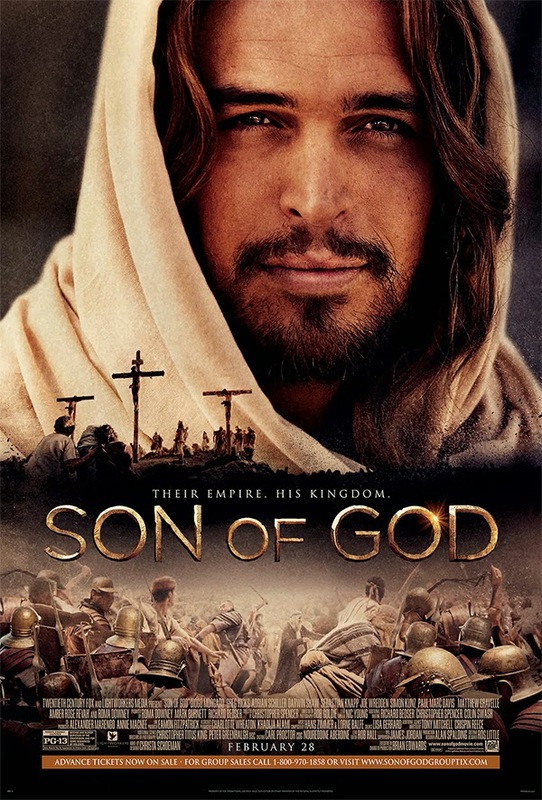 This review serves only as a critique on what the SON OF GOD is: a film. The film is made up of segments from last years hit mini-series THE BIBLE, specifically the portions that adapt the classic writings about Jesus of Nazareth. It almost ends up feeling like a greatest-hits compilation (born in a manger, raising the dead, walking on water, feeding the masses, embodying moral decision, dying on the cross) which ends up being both a good and bad thing. I missed THE BIBLE mini-series run, so the film was new to me. However, it’s undeniable that what you are watching was made for television and it feels like it. From certain performances to the “lets get to the point” writing to the visual effects, SON OF GOD doesn’t ever truly feel like a cinematic event. It’s a shame, because the subject matter begs for a larger budget and production. One feels empathy for whoever had to edit this movie. Clearly when you’re putting together a whole film out of the pieces and parts of a previously existing work, things are going to feel a bit jarring, and they do. For much of the movie the stories feel smashed together. Often scenes are only tied together with poorly created CGI exterior shots of Jerusalem or Nazareth. Only when we get around to the trial and crucifixion of Jesus does the film feel as though it was made to be continuous. Casting choices range from respectable to totally unacceptable. Portuguese actor Diogo Morgado in the role of Jesus comes off likes like a combination of the popularized image of Jesus (shaggy auburn hair, perfect beard, piercing blue eyes) and Ashton Kutcher. On image alone it works, as looking like the iconic Jesus image seems to be the main goal here, and beyond that Morgado brings a warmth to the role that allows us to forgive the predictable casting. Others such Sebastian Knapp playing John and Darwin Shaw playing Peter are believable enough, but it's Greg Hicks as Pontius Pilate who is most appropriate for his role. However, Roma Downey as Mary, the mother of Jesus, feels like a total casting error. Downey created and produced SON OF GOD alongside her husband Mark Burnett, who has created some of the most recognizable shows on TV (SURVIVOR, THE VOICE, SHARK TANK). It’s extremely hard to take what is supposed the subject matter seriously when the mother of Jesus clearly has extreme plastic surgery and Botox. More care should be taken in casting such an iconic figure. In the film Jesus says that God blesses those who are humble. I only wish Downey would have taken this to heart and resisted the urge to play Mary. In SON OF GOD we see Jesus overturn tables of money as people are buying and selling within the Temple. Is it appropriate to profit if the goal is to worship? The same could be asked of Downey and Burnett, who are now recycling TV gold and hoping to strike it big in the theaters. Sure they’re looking to share the story of Jesus with millions. It’s just that those millions have to pay a lot of money to get that message. The ethical boundary of profiting off of Jesus lingers, but it’s a question I’m not qualified to answer. Still it’s hard to totally fault SON OF GOD. It succeeds exactly where it’s intended. It’s perfect material for a family to take in, especially for those perusing deeper knowledge of Jesus and the Bible. For youngsters seeking a launching off point, SON OF GOD is serviceable, and to complain about many its shortcomingsfeels almost petty. The purpose of SON OF GOD is clear enough and for those looking to embrace the themes, its purpose is served. Those who have already taken in THE BIBLE or are looking for a more theatrical experience might be best served to pass on this one. recently watched it. it was a waste of time. clumsy work. ridiculous scenes. horrible story. I must add that I hate religion.